The Antiphospholipid Syndrome journey is one of courage, strength and determination. This exclusively designed No One Fights Alone® Necklace will serve as a constant reminder that we are all surrounded by the love of family and friends. Each necklace has a subtly etched ribbon and includes Burgundy Ribbon Awareness Charm. 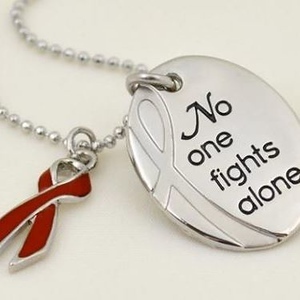 This necklace is the perfect gift for yourself or a loved one and provides a constant reminder that no one is in this fight alone! Oval pendant measures 1" x 3/4"
Beautiful 18" faceted ball chain with 2" extender and tag charm. Lead-free and nickel-free silver tone. 100% of the proceeds go the APS Foundation of America, Inc.